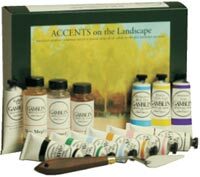 This painting set offers landscape painters something no other set can – Robert Gamblin’s experience. Great oil paint supplies per Mr. Gamblin himself. The color selection is based on accents from Gamblin’s own landscape palette. The set contains nine 37ml Gamblin Artists Oil Colors, specially chosen to produce unique accents and optical effects. It also includes mediums (37ml Galkyd Gel, and 2 oz. each of Gamsol and Neo Megilp), a 6"" x 8"" gessoboard and a palette knife. There’s also a personal message from Robert Gamblin offering general information on landscape painting and explaining the benefits of adding these special colors to the landscape painter’s basic palette. All colors in this set are mixable into the myriad colors of any landscape.